Wooh! Glad to be back finally. The past one month has been really hectic with work schedules and personal commitments. I apologize for not posting any new recipes for more than a month. Thanks for being patient. We had some of our friends over for dinner the other night. One of the dishes I wanted to make was mango pickle but the mango, which I had bought raw had started to ripen, since 2 weeks had passed from the time I bought it. So, change of plans. I decided to make mango chutney instead. I sat down with a paper and pen and wrote down the ingredients based on my thoughts of how I wanted it to taste. Thankfully turned out just the way I wanted it to. I wanted to make sure that the chutney wasn't too greasy or too sweet, and wanted to achieve that balance. It turned out darn good. 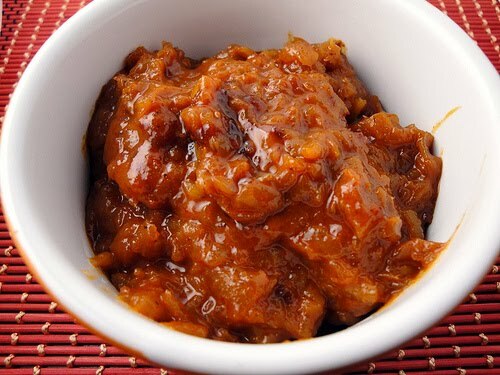 You can have this chutney with sandwiches, puris, chapatis, or as is and enjoy it’s tarty, sweet and spicy flavor. And extremely easy to make. Keep all the ingredients ready so that you don’t forget anything at the time of need. With a peeler, remove the skin from the mango and grate it using the biggest holes in the grater. Set aside. In a blender, add the cinnamon, cardamom, cloves, and ginger powder and grind the ingredients very fine. In a large pan on medium heat, add the oil. When the oil starts getting hot, add the cumin and fennel seeds. When you start to smell the aroma of the seeds before they darken, add the chili powders. Mix well and let the chili powder cook for a few seconds. Add the jaggery and 1/4 cup water. As the jaggery starts to melt a little add the grated mango, the ground spice, and salt. With a spatula, turn everything so that all the contents in the pan are incorporated well. Cook on low to medium heat, until the mango is cooked and the water has melted away. Add 1/8 cup water at this point and mix well, and cook just enough until you see the glaze on top. Take off the fire. Serve at room temperature.